The first thing that hit me in Lara Croft GO was the gorgeous soundtrack that begins at the title screen. I knew from that moment that I was about to experience something special. And I wasn’t wrong. Not only does the chill, ambient music stay strong throughout the game, but the visuals and gameplay are also outstanding, making this game the full package. Many have been comparing the game to Monument Valley, and for good reason. The gameplay itself is not really comparable, but the low-poly artwork and music definitely feel like they might have gotten some well-deserved inspiration from there. 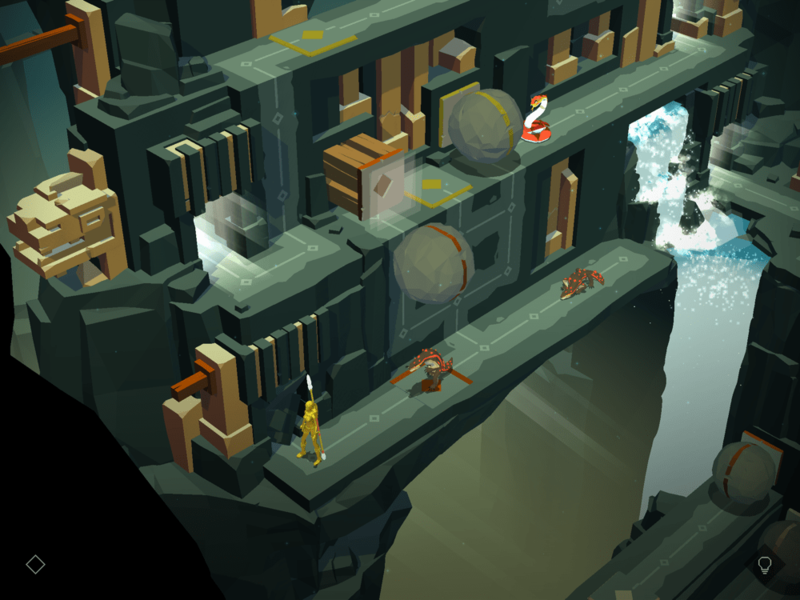 That doesn’t mean Lara Croft GO feels like a clone. Quite the opposite! But it offers that same relaxing, gorgeous appeal of Monument Valley while while bringing its own unique style to the table. Visually, the game offers many lovely touches, like the way Lara pushes a lever with her foot, occasionally rolls over to the next spot, does handstands or even backflips over an enemy while shooting it. The scenery is equally impressive, with lush rainforests, gloomy caverns and gushing waterfalls. 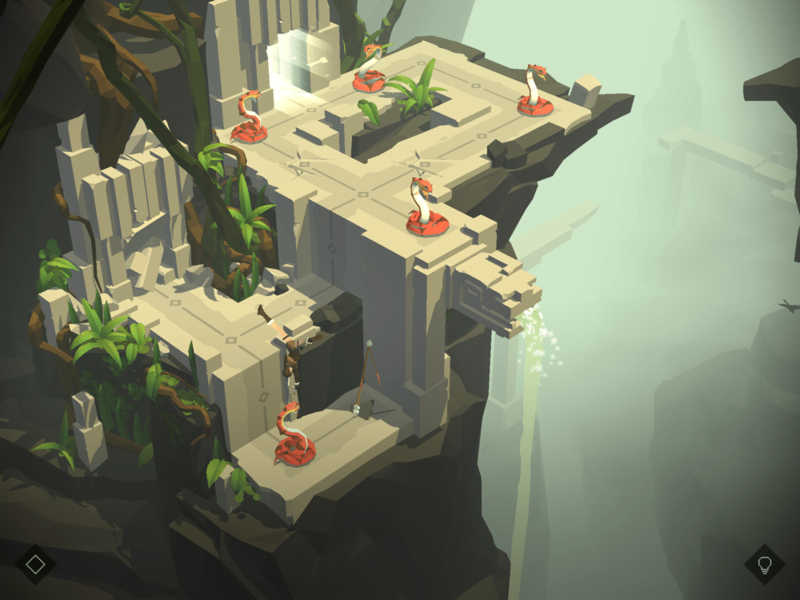 The gameplay in Lara Croft GO could be described as turn-based strategic puzzles. It’s a game that tests your mind instead of you skills. It’s built for touch screen devices and, thankfully, there are no on-screen buttons to hide the gorgeous visuals. Instead, you swipe the screen in any direction to move Lara one space — or “node” — over. The objective is to get her from the starting position to the ending position, but there are always obstacles in the way. The game gets progressively trickier as new obstacles are introduced, such as spiders, lizards, boulders, blades, and even this gorgeous creature, the snake queen. By far, my biggest gripe with the game is the loading times. As you may have noticed in the video above, even on the latest technology — an iPad Air 2 — the game takes about five or six seconds to restart a level or stage. This means that while you’re still working out a strategy and possibly dying or simply messing up a whole bunch of times, you will spend a considerably large amount of time watching the three dots of the loading screen. On certain tricky stages, it started to get a bit maddening. I hope the game can be streamlined a bit to improve this, as everything else about the game is nearly perfect. Related to this, I also would have appreciated an “undo” button — not for when I die, but for when I realize a millisecond too late that I made the wrong move and then have to start from scratch. Or even when I accidentally swipe one too many times because I didn’t realize the game registered my first swipe. I know it’s a strategic puzzle game and you’re supposed to think out your moves. But unlike Hitman GO, the animations and action feel more alive. I would often even forget that it’s turn-based, not real time. So I would move fairly quickly, only to make a mistake. I would have liked the game to be a bit less punishing about those instances and a bit more user-friendly. I also question the developer’s motives when they leave out an “undo” button but offer an in-game guide that costs extra. Still, the fact that each level is broken up into stages makes this a small quibble, and nothing to be too bothered by. Since I mentioned Hitman GO, I’d like to take a moment to compare the two. I only got to the second level in the second chapter of Hitman GO before I quit. I was finding it more frustrating than fun, and the inability to skip more than a couple of levels without spending more money left me with limited choices. Since I wasn’t enjoying it enough to spend more to unlock the rest, I chose to simply stop playing. I also wasn’t drawn to the world as much as I was to Lara’s. Hitman’s is very static — it’s meant to mimic a board game — whereas Lara’s feels alive. I think those who liked Hitman GO would also enjoy this one, but you don’t have to like the previous to love the latter. 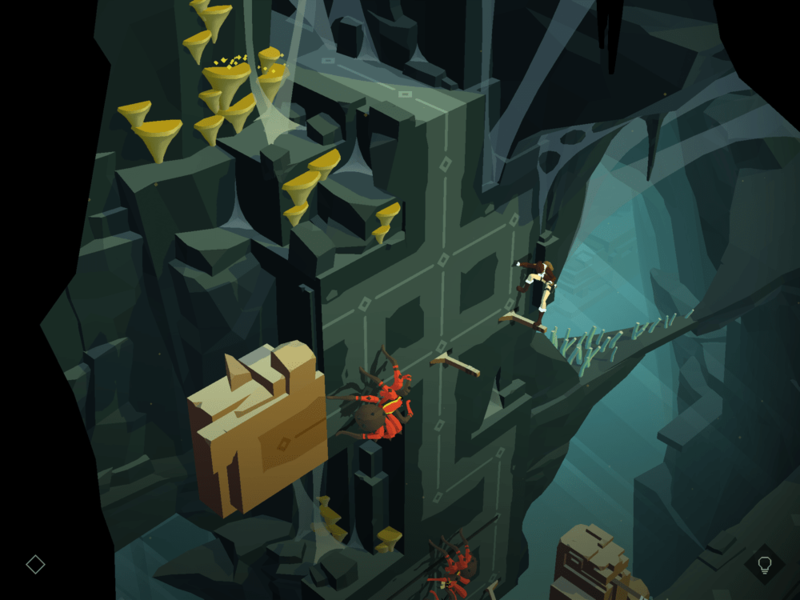 For those who care about it, there is a bit of replay value to Lara Croft GO. Throughout the game, there are a number of vases to find and break. Each one holds either a relic piece or a gem. 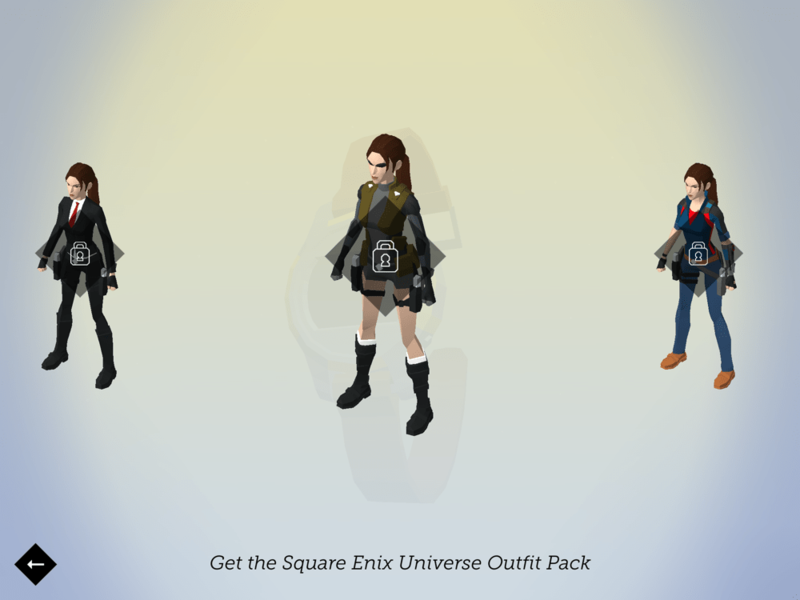 Each time you complete a relic, you’ll unlock a new costume for Lara. If you find all the gems, you’ll unlock a particularly odd — but still fun — costume. The vases get very tricky to find in later levels, so it will likely take you some time to collect them all. Personally, I didn’t really enjoy searching for the vases, as I’m not much of a hidden object fan. But I worked on finding them anyway because I wanted the costumes. There are also some interesting achievements that are fun to try and get. I would have liked more of those, as they’re more interesting than simply looking for hidden vases. While this is a premium paid game that can be fully enjoyed without spending any extra money, there are in-app purchases (IAP) for hints and optional costumes. Instead of buying hints, you can just use my walkthrough. Personally, I don’t buy vanity items in games. I’d much rather put that money towards playing another game. But if you really want to dress Lara up in a Hitman suit, it’ll only cost you $1.99. Overall, I thoroughly enjoyed my time spent with this turn-based version of Tomb Raider. Any issues I had with it are minimal and I didn’t even have a problem with its length as I’ve heard others complain about. If you take your time and don’t cheat, most people should get several hours of entertainment out of the game. Now that I’ve finished, including all collectibles and achievements, I would love to see more. But I definitely feel I got more than my money’s worth with Lara Croft GO. If you’re looking for a chill but challenging puzzle game, I can’t recommend this highly enough. Go download it here now! 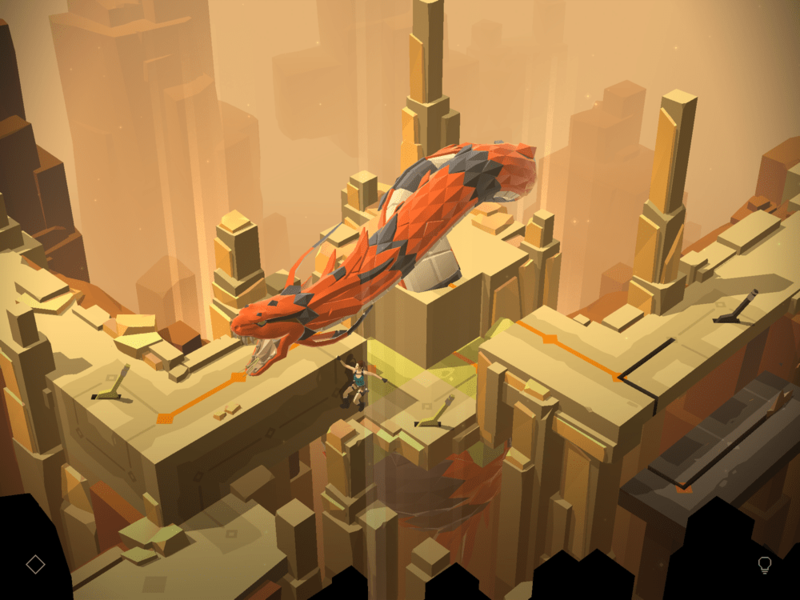 If you get stuck anywhere, you can try my Lara Croft GO walkthrough guide.